Once a rather rare hobby, beekeeping is becoming more popular in both urban and rural areas. There are many advantages to taking up beekeeping. Beekeepers can enjoy the health and taste benefits of fresh honey. They can use the wax to make candles or lip balms. Pollinating bees help to keep plants in the area healthy. Watching the bees do their work, with a little help from you, can be a very rewarding experience. People who are completely new to beekeeping are often searching for a kit that can help them get started as quickly as possible. One such kit is the Honey Keeper Beehive 20 Frame Complete Box Kit. 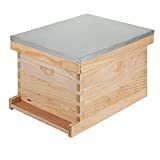 What is the Honey Keeper Beehive 20 Frame Complete Box Kit? 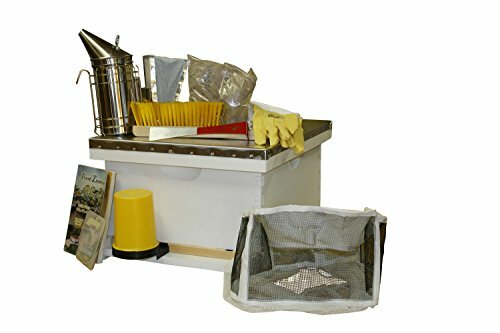 The Honey Keeper Beehive 20 Frame Complete Box Kit is a beehive unit that is designed to have just about everything a person needs to begin their new habit of beekeeping. The telescopic roof is specially shaped to guide rain away from the hive. This protects bees from rain and keeps their home from becoming too hot or too cold. The bottom board helps to protect against inclement weather as well. The entrance reducer can be used to protect weaker hives from being attacked and robbed by other bees, such as yellow jackets. A smaller entrance to guard gives the bees a better chance of protecting their home. This can be especially important for beekeepers who are just starting out, when their hive is still small and more vulnerable. Entrance reducers can also regulate air flow, help keep snow and rain from getting into the beehive, and discourage rodents from crawling in. The queen excluder is meant to keep the queen away from the honey collection panel, because if she lays eggs in it, it becomes difficult to clean. This is a Langstroth style beehive. A Langstroth style beehive is a hive that has vertically hung, removable frames. These allow beekeepers to check their bees and collect honey. It is 11.1 x 19.8 x 22.8 inches and weighs 48.45 pounds. Some assembly is required. The kit includes the instruction manual, heavy duty nails, a metal capped telescoping roof, a bottom board, an entrance reducer, a queen excluder, and an inner cover. It is divided into ten medium-sized frames and ten deep frames. The structure is made of fir wood, and the frames are made of white pine. The frames have unwaxed foundations with hexagonal surfaces. This bee kit can be found on Amazon for about $140. You will have to put this together yourself, but most reviewers have reported that it is easy to do if you follow the instructions. It has pre-cut finger joints and includes heavy duty nails. 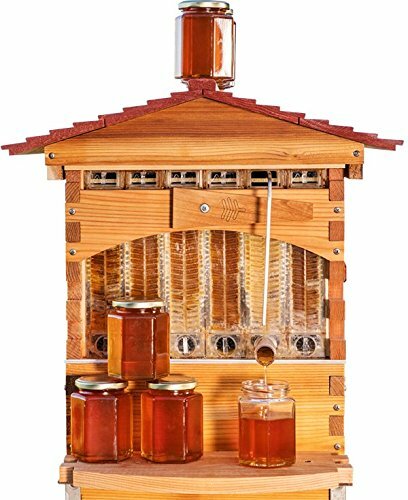 Most reviewers have been able to build their Honey Keeper Beehive 20 Frame Complete Box Kit in about an hour. One reviewer reportedly was able to put it together in less than 15 minutes. Some reviewers have complained that the wood is too weak, and can split while you're nailing it if you're not careful. Other than that, it is well-made, durable, and watertight. It is also attractive and natural-looking. No warranty information was available for this product. This product is 20 inches long, 16 inches wide, and 10 inches high. It is made of corrosion-resistant pine wood. There are several advantages to pine wood. First, it is durable and holds up over time. Second, while some woods have odors that get absorbed by the honey, changing the taste and aroma, pine wood doesn't do that. The roof features interlocking slats that guide rain down and away from the hive, keeping the bees dry and safe. Circular holes on the sides of the roof allow for good airflow. The BestEquip Beehive has a sturdy base with room for an outside feeder, and also includes an entrance reducer and a queen excluder. The hive has one clear panel that allows beekeepers to watch their bees in action and check to see if the honey is ready. Another panel is designed to allow beekeepers to extract the honey without disturbing the bees by removing the frames. It comes with 7 frames, and a honey container. The large honey passages speed up the honey collection, and the auto flow system makes it easy to collect the honey without having to remove the frames. The instructions are simple, and It is easy to put this beehive together. Holes are pre-drilled, so you will only need screws and a screwdriver. This takes about as much time as the Honey Keeper Beehive 20 Frame Complete Box Kit takes to assemble. The pine wood has many benefits. It is light-weight, holds up well over time, is corrosion resistant, and does not cause honey to absorb its smell or taste differently. The clear side panel is a great idea because it allows beekeepers to look in on their bees. The honey extraction system does not require anything to be taken apart or removed, meaning less disturbance and stress for the bees. Some users have worried that the circulation holes on the roof could allow intruders, but a suggested solution is to add screens. The Legacy DIY Beehive Starter Kit comes already assembled. In addition to the actual beehive, many other beekeeping necessities are included: a hatless veil, plastic coated gloves, a smoker with fuel, a bee brush, a hive tool, an entrance feeder, and an entrance reducer. It also includes a book and DVD about the basics of beekeeping for beginners. The design of this beehive is similar to that of the one included in the Honey Keeper Beehive 20 Frame Complete Box Kit. It is a Langstroth style beehive. It has a telescoping roof, a bottom board, and frames. The foundation of this beehive is wire, instead of wood or plastic-like foundations that come with some other beehives. This kit is simple enough for the beginner. It comes already assembled and ready for use, and also includes a book and DVD. The company has a support hotline for beekeepers who have questions. This is designed to be simple and strong, for beginning beekeepers. This beehive is made from western red cedar, with food grade, BPA-free plastic frames. It is 19.9 inches x 14 inches x 9.7 inches. It has a screened bottom board and an inner cover. It is designed to keep the bees dry at all times, preventing mold and wet bees. It has a gabled roof that directs rain water away from the beehive while also protecting bees from the sun and keeping the temperature cool. It features an observation window so that beekeepers can watch the bees. To collect honey, beekeepers insert a Flow Key, which causes the honey to come flowing out of the tubes. No smoker is needed. Honey collection jars are not included. While marketed towards beginners, some reviewers recommend that this be used only by experienced beekeepers because it can be difficult to understand the automated aspects of it. Reviewers have had mixed feelings about the design. It makes honey collection easy, but it also prevents beekeepers from being able to collect wax. Experienced beekeepers also note that many bees do not like plastic frames and may refuse to use them. It is easy to assemble and can be put together in under an hour. Protects bees from rain and heat. 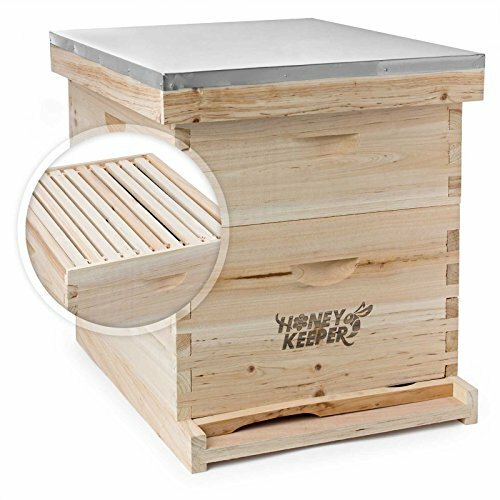 There are a few things that make us think the Honey Keeper Beehive 20 Frame Complete Box Kit is the best choice, especially for people who are just starting out on their beekeeping journey. First of all, we like that the telescopic roof keeps the rain out, which provides a safe and dry home for bees. We like that the entrance reducer and queen excluder are included. We appreciate that the frames are made of wood, because we've learned that bees often reject plastic frames. We like that it is fairly easy to assemble, and the only thing not included is a hammer for hammering the nails in. 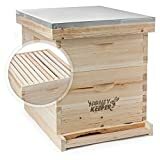 Available for only $140 on Amazon, the Honey Keeper Beehive 20 Frame Complete Box Kit is also the most affordable of the beehive kits we reviewed. A few of the beehive kits we reviewed were of the type that allow the beekeeper to extract the honey without actually interacting with the bees. If new beekeepers are looking for a system that will keep them from having to come face-to-face with bees, then they may want to check out the BestEquip Beehive Auto Flow or the Flow Hive Classic. However, the flow type of beehive kit is controversial in the beekeeping community. Many long-time beekeepers argue that the flow design takes away from the beekeeping experience. Beekeepers like having to interact with bees, and many feel that the flow design makes beekeeping seem only as complicated as operating a keg or a soda fountain. So if you are looking for the true beekeeping experience, we would recommend the Honey Keeper Beehive 20 Frame Complete Box Kit. We'd give it five stars, but several reviewers mentioned their concerns about the wood being a little flimsy. Overall, we give it four stars.